Microneedling For Hair Growth - Proven 5X More Effective Regrowth! Microneedling For Hair Growth – Proven 5X More Effective Regrowth! There are a variety of ways to counteract hair loss using conventional methods – such as minoxidil and finasteride – and even some unconventional. One of the latter is microneedling. In this article you’ll learn how to use microneedling, a common cosmetic therapy used for the treatment of skin imperfections, to stimulate hair growth. I’ll cover the research studies which show that this method may be an effective way to combat hair loss. You’ll also learn why it’s important to perform the method correctly to prevent damage to the scalp and further hair loss and how to do so. Microneedling is another name for Collagen Induction Therapy (CIT) and is commonly associated with the dermaroller (1). This is a popular cosmetic procedure, used mainly for the treatment of wrinkles and other signs of aging on the face. It’s also increasingly being used to treat scarring, acne, and other such skin imperfections (2). How Can Microneedling Help with Hair Loss? Microneedling works by causing small, pin-prick sized wounds in the skin. These aren’t wounds in the classic sense of the word, however, and microneedling should not cause bleeding when done correctly (both at the right depth and with the right amount of pressure). These “wounds,” however, initiate the three healing phases which skin typically undergoes after trauma. This stimulates collagen production, as well as the production of new skin cells (3, 4). As was shown in a 2007 UK study, scarring only occurs after skin injury has reached a certain depth (6). With microneedling therapy, the needles do not exceed this depth. They do, however, still cause enough trauma to instigate the inflammation-proliferation-maturation cycle. 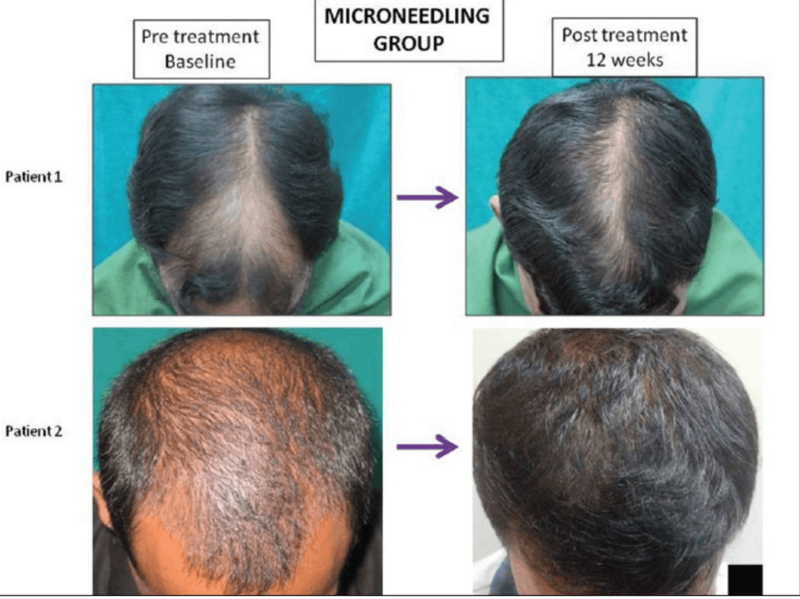 The positive effects of this cycle was obvious when microneedling was used, in combination with Triamcinolone Acetonide, to treat alopecia areata (7). Two patients, one male and one female, presented with alopecia areata. This is an immune-related cause of hair loss and typically results in patchy, uneven hair loss. Source. Clinical picture of male patient showing multiple alopecic patches all over the scalp. Source. Male patient showing excellent hair growth after three sessions. Source. (a) Female patient after 1 session; (b) Female patient after 2nd session. So, microneedling is effective at treating alopecia areata? But what about androgenetic alopecia, also known as male-pattern baldness? There have been a variety of studies performed on humans to understand the effects of microneedling on individuals with alopecia. Let’s take a closer look. In 2013, 100 men with Androgenetic Alopecia (AGA) were recruited to take part in a study which tested the effects of microneedling on hair growth. 94 men completed the study (8). The men were randomly split into two groups. The first group, which consisted of 50 volunteers, was treated with both microneedling and minoxidil (5 percent) lotion. The second group, which consisted of 44 volunteers, was treated with minoxidil (5 percent) lotion. Both groups would apply the minoxidil twice daily, but the microneedling group would also receive a once-per-week microneedling treatment. The participants in the microneedling group were instructed to not apply Minoxidil on the day of microneedling treatment, but resume application 24 hours after the procedure. All participants’ scalps were shaved at the beginning of the study. Throughout the study, researchers used a 7-point scale to measure hair growth. A grade 3 response on 7-point evaluation scale in the microneedling treated group. Source. A grade 0 response on 7-point evaluation scale in patient no. 1 and grade + 1 response in patient no. 2 in the Minoxidil treated group. Now, keep in mind that both groups did apply Minoxidil on a regular basis. 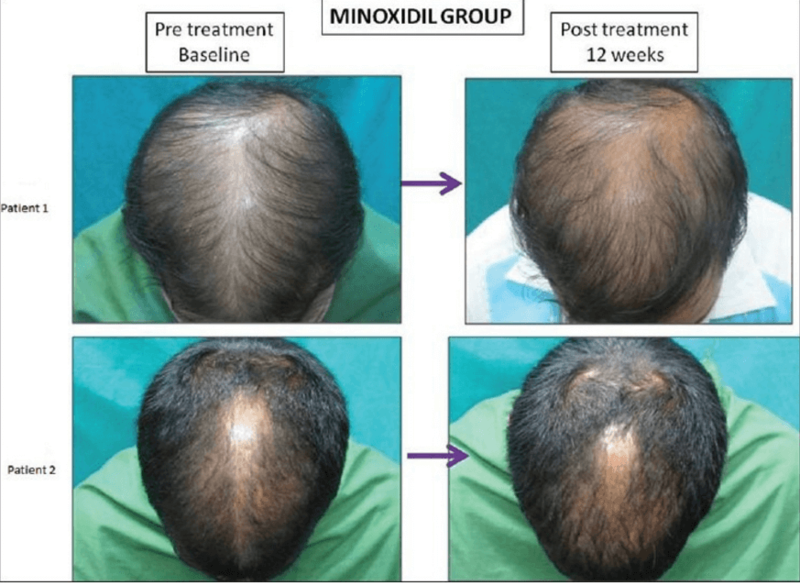 However, the group which combined microneedling with Minoxidil application saw significantly more hair growth in the same period of time as the minxoidil-only group. How much more hair growth? 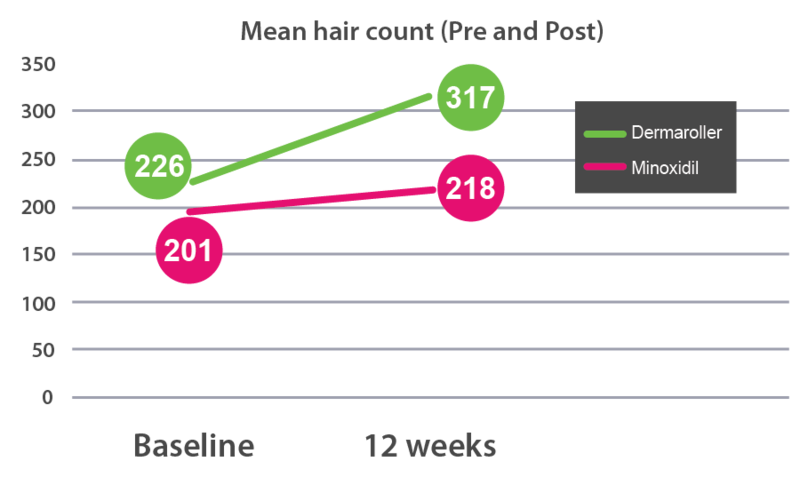 Mean hair counts at baseline and at end of 12 weeks in the microneedling and Minoxidil treated group. While the mean hair count in the microneedling group did start a bit higher than the mean hair count in the Minoxidil group, the difference was not significant. 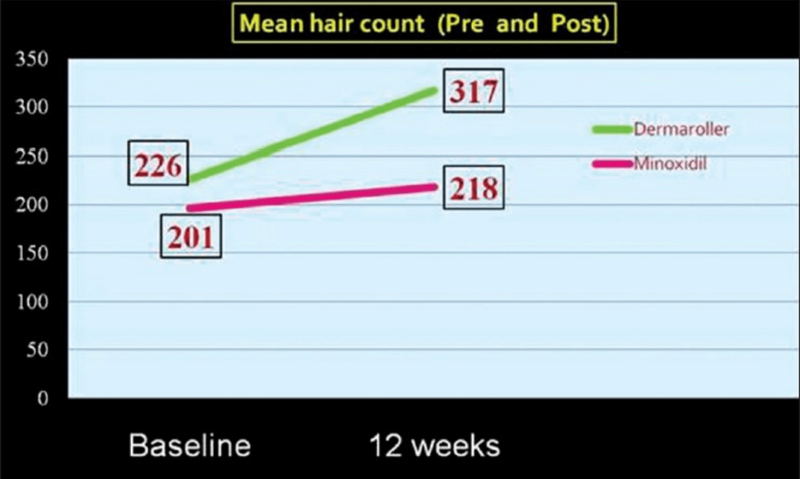 As can be seen, the microneedling group still saw a significant increase in mean hair count (+91) over the Minoxidil-only group (+17) at the end of the 12 weeks. Source. Change from baseline hair count at 12 weeks. It’s quite obvious that microneedling in addition to minoxidil application is much more effective at inducing hair growth than just minoxidil alone. But what about the effects of microneedling in men who have not had success with conventional hair loss treatments? Finasteride and minoxidil are the most common therapies used in the treatment of alopecia, but their efficacy rates vary between 30 percent and 60 percent (9). This means that some men (and women) may need to seek out a less conventional approach. In 2015, researchers from India recruited four men who had been on finasteride and 5 percent minoxidil solution for the past two to five years (9). While their hair loss didn’t continue, there were no signs of growth. The four men were subjected to microneedling sessions over a six-month period combined with their current therapies. A 7-point evaluation scale was used to track results, and the men were followed up with for 18 months to assess treatment sustainability. The patients experienced a +2 or +3 on the standardized evaluation scale, and new hair growth was noted after 8 – 10 sessions. Even further, these results were sustained over 18 months. This is the first case series to report the boosting effect of microneedling with respect to new hair follicle stimulation in patients with androgenetic alopecia who were poor responders to conventional therapy. So, how can you get started using microneedling to fight hair loss and induce the growth of new hair? Microneedling can be performed in a clinic or at home. So, which one is right for you? The benefits of in-clinic treatment include the use of high-quality tools and access to professional knowledge and expertise. Licensed microneedling professional such as dermatologists, aestheticians, and cosmetic surgeons can ensure that needles of the correct length are used for best results. They can also be sure that no damage is done during the procedure. However, a clinical session can be cost prohibitive. So, are at-home treatments a viable alternative? Fortunately, yes. Microneedling is not a surgical procedure, and it’s possible to perform it on yourself without any particular training. You may need to experiment with the various tools (which we’ll discuss more later) to find the one you’re most comfortable with. If you’d like to begin microneedling therapy at home, you have a few options: dermaroller, dermastamp, or dermapen. 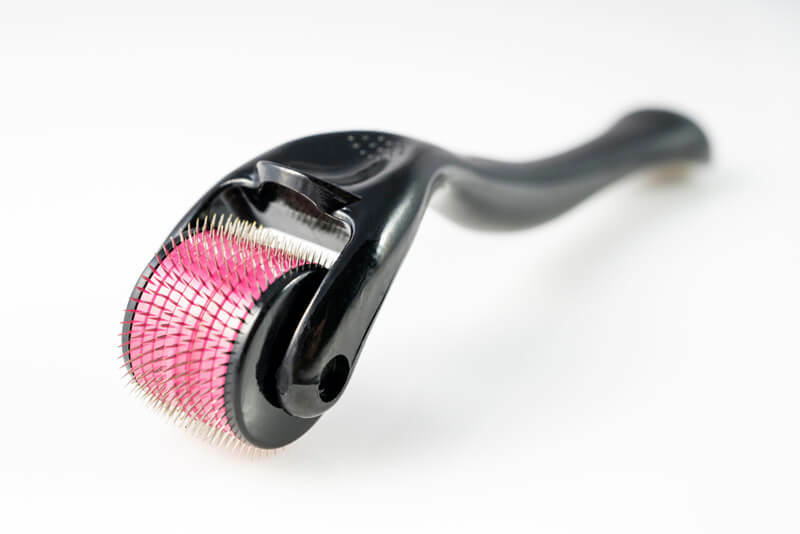 The dermaroller is the most common microneedling tool. It includes a needle-laden rolling pin attached to a handle that can be easily maneuvered over the scalp. The other two options – the stamp and the pen – are smaller tools that enable you to target more specific areas of the scalp. They are also safer in that there is less risk of damaging surrounding hair follicles by pulling the hairs out at the root. 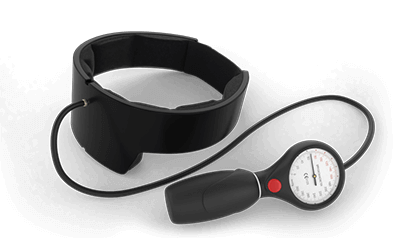 Once you’ve chosen your tool, it’s time to perform your first session. First and foremost, always sanitize the tool before use. Failure to do so can lead to infection and other such issues, and it’s just not worth the risk. To use the dermaroller effectively, you’ll want to focus on direction of application, as well as pressure applied. The dermaroller should not cause any pain (though you may feel tingling/stinging in more sensitive areas) and it should never draw blood. This means you should only apply enough pressure for the needles to penetrate the scalp to the depth of the pin. As for direction, maintain a consistent pattern of up and down, side to side, and even diagonal. This will ensure even distribution of hair growth, and is important if you want to see results commonly associated with microneedling. Perform each motion about 2-3 times. If you’ve instead chosen the stamp or pen, the application process will be slightly different. The dermastamp is a small, rectangular block attached to a handle. The dermapen is an even smaller tool with a circular appearance similar in style to a pen. The stamp and pen will be applied with equal pressure as the roller. To use the stamp, apply horizontally to the area you wish to target and hold in place for 3 – 5 seconds. Rotate the stamp vertically and apply pressure, and then rotate diagonally and do the same. To use the pen, place the opening of the tool over the area. Press down (either by pushing the tool against your scalp, or by clicking the plunger towards the end) and hold for 3 – 5 seconds. As the procedure involves intentional wounding, there is always risk of complications and adverse effects. The most common side effects include redness, tingling and/or irritation, bruising, and even oozing from the wounds. Redness and inflammation are very common and, according to the American Academy of Dermatology, should subside after five days (10). This precaution also extends to anyone with a history of open wounds, or anyone who currently has acne or open wounds on the scalp or hairline. The most severe complication is infection as this is a concern whenever a wound is present. To prevent this from happening, the wounds should be kept clean and the tool should be sanitized before each use. As a natural and easily-accessible hair loss treatment method, microneedling stimulates new cell production and encourages the growth of new hair. And whether you choose to use it in combination with, or in lieu of, traditional hair loss treatments including minoxidil or finasteride, it may provide the boost you need to stop your hair loss and even promote new growth. How often do you suggest using the dermaroller after hair HAS grown back? Should this be part of regular treatment or used to jumpstart the process of hair growth? In some cases you won’t need to use the dermaroller at all once the hair has grown back. If you fix the underlying cause of hair loss then the dermaroller is simply a way to stimulate lost hair to regenerate. 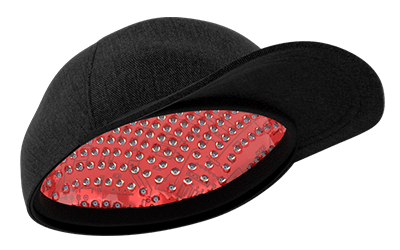 However, you may still be suffering from DHT sensitivity, in which case you almost definitely will need to keep microneedling to keep the hair there. Do you recommend using this for AGA? It is safe using a dermaroller? Do you recommend some model? Absolutely dermarolling can be used in those with AGA. In fact, many of the studies done on the topic are performed on men with AGA. How often should we use derma roller to initiate hair growth ? It’s recommended to not dermaroller more than twice per week. Ideally, you should wait 6 days between each session to allow time to heal. how often should you use a derma stamp? We recommend using the dermastamp once per week. Great post! When you mix microneedling with PRP for hair restoration you can get even more impressive results. If I use the dermastamp and then apply the the elixir to same area, should I expect a burning sensation? You shouldn’t apply the elixir right away. Apply to the same area but after waiting at least 6 hours. How to clean dermaroller ? Our adjustable dermastamp is the best device because you can easily adjust the length of the needles to perfectly match the depth needed depending on which part of your scalp you are using it on. What size of needle you use for for hair growth and how often? I don’t want to give any hard and fast rules for needle size and how often because I’ve learnt that everyone is different. This is why i recommend the adjustable dermastamp, so you can easily adjust the needle size to suit you. As a rule of thumb you can go with 1x per week. Is using the Dermaroller by itself effective? I tried using Minoxidil before, but it gave me severe headaches. By itself it is still effective, although looking at the studies, not as much as when used in combination with a topical treatment. Your experience with Minoxidil is fairly common, there are some other readers who have shared their experiences with side effects in the comment section of this article: https://www.hairguard.com/minoxidil-side-effects. Is the Dermaroller effective on its own? Yes it can be, however it you’ll certainly get better results by using it in combination with a topical treatment. What would you recommend other than Minoxidil? I used Rogain for a while, but I was getting painful headaches! I prefer to use the Grogenix Scalp Elixir. Ultimately you have to make the choice yourself, that’s just my preference. I’ve been using Minoxidil for years and have already gone through the initial shedding. If I start the microneedling should I expect another shedding period? Hi Millie, I wouldn’t have thought so. I didn’t get any shedding when I first started microneedling. The shedding is believed to be caused by the hair follicles switching growth phase, so some of the resting phase follicles fall out to be replaced by growth phase follicles. I wouldn’t expect this to happen to much at the start of microneedling. Go slowly to start with and have at least a week in between sessions and you should be fine. I have very long hair but because overdose of steroids lost hair and got very wrinkley skin on arms. so, if I micro needle my arms to get rid of loose skin and wrinkles will that PROMOTE hair growth on my ARMS? also, for my head, since my hair is so long but my hair has really thinned out all over head can I still micro needle whole head? and how can I easily treat whole head ( with long hair) with the before and after treatment. Thank s for any and all help. Hello Rorr. No you won’t grow hair on your arms from microneedling. Yes you can and should follow do it all over the scalp. 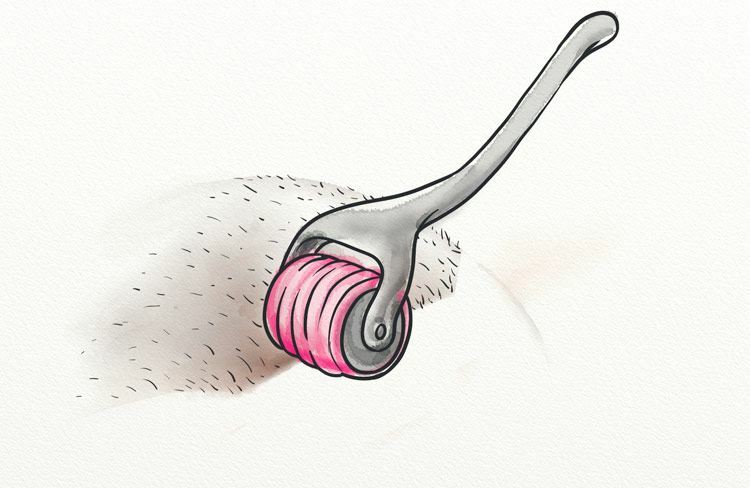 If you have long hair then some people prefer to use the dermastamp rather than a roller as this prevents the hair getting caught up in the roller. Can I use a 1.5 mm weekly over the areas where I am experiencing thinning hair? Hello Kevin, that would be fine. You might want to try some different size needles to see which feels best and gives the best results. Hence why the adjustable dermastamp is a good option because it’s easy to adjust the needle size.